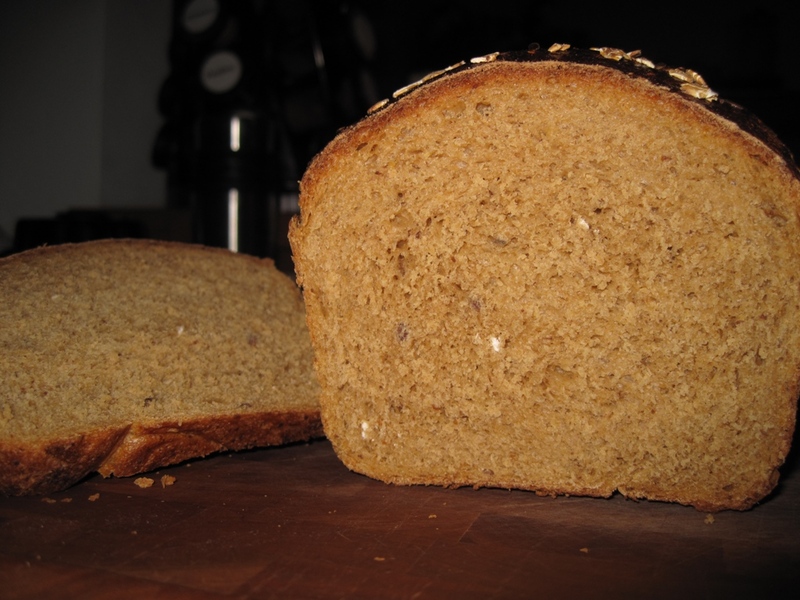 I didn’t waste any time with this project – January 1, 2012 was Oatmeal-Flax Molasses Bread day. I chose this bread for one main reason: I happen to have molasses. I buy one bottle every two years or so, and I hardly ever have any use for it. Why I keep buying it, I don’t know. But today I was glad I had. 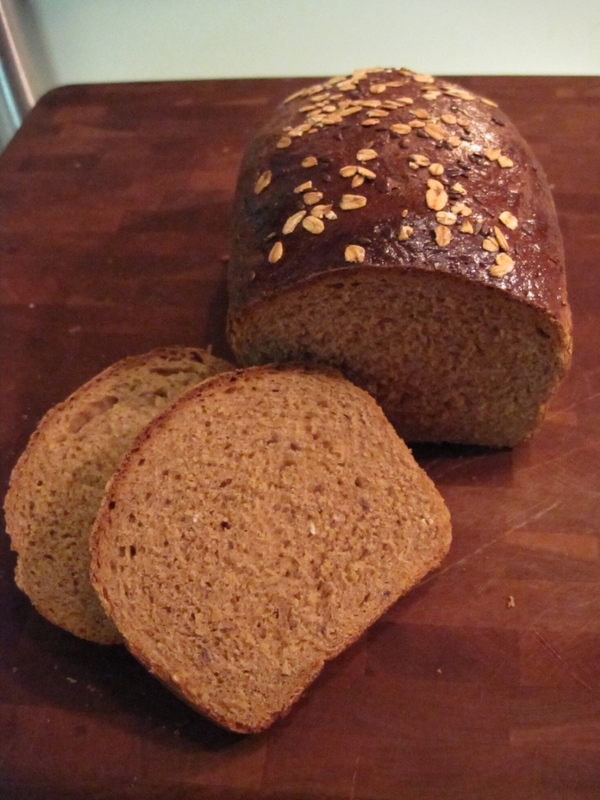 I was poking around The Joy of Cooking (my favorite cookbook), and found a recipe for Oatmeal Molasses Bread, which I adapted. It wasn’t too difficult, and produced great results (with some tweaking that I’ll explain in blue). Recipe and photos after the jump. Cook, stirring occasionally, over medium-low heat until oatmeal is soft, smooth, thick and free of lumps (about 20 minutes). Let cool, stirring occasionally, until tepid and no warmer than 115°. This is where I began to distrust the recipe a bit. After adding 4 cups of flour, the dough wasn’t just moist or sticky, it was loose and runny, slightly thicker than dumpling batter. I was pretty sure I wasn’t get to get good sandwich bread from such a loose batter. So, I kept adding flour until the dough no longer stuck to the bowl. I didn’t measure, but I added at least another cup and a half. At least. It was also at this point that I added about a tablespoon of whole flax seeds and the same amount of uncooked oatmeal, both for texture. Onward. Loaves before panning. Notice the cute little flax seeds tucked in there! 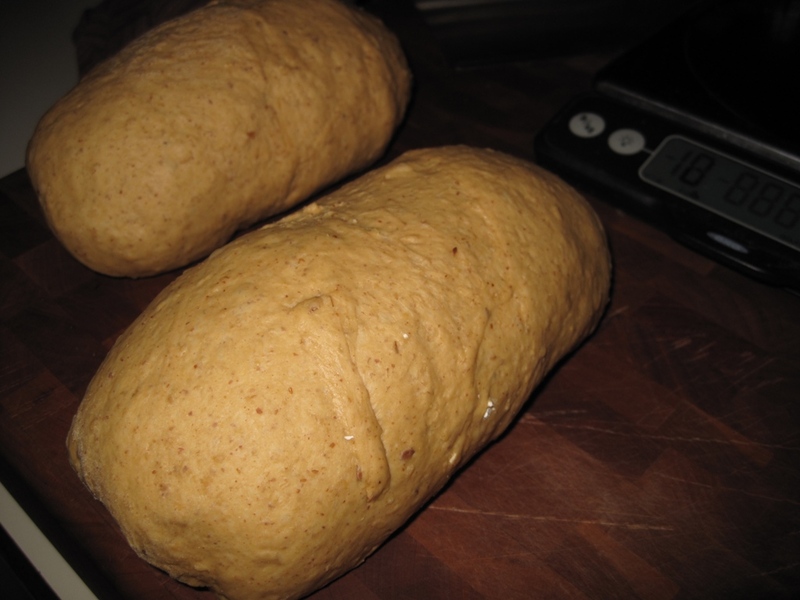 Form the dough into free standing loaves, or place them seam-side down in oiled bread pans. Cover loosely with the damp towel, and let the dough rise in a warm place for another 1 ½ hours until doubled in volume. In the pan, prior to the egg wash.
Preheat oven to 375°. If you’re making free-form loaves, slash the tops before baking. 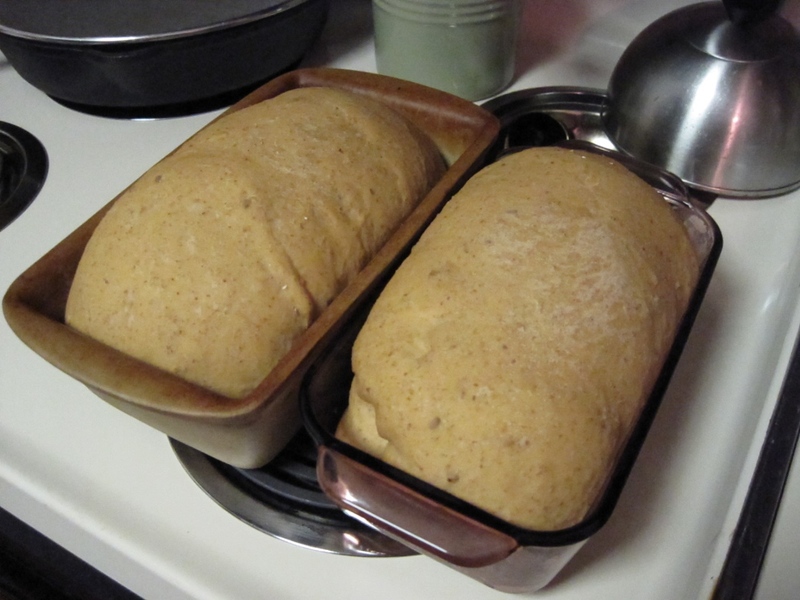 I topped my loaves with an egg wash and a sprinkling of oatmeal and flax seeds. Bake until the bottoms of the loaves sound hollow when tapped, 40-45 minutes. You can also use an intant read thermometer to tell if they’re done – 190° is the right temperature. Remove from pans to a rack and let cool for at least 30 minutes before serving. It wasn’t dry! I was a little worried after adding all that extra flour, but it turned out to be the right thing to do. The crumb was perfect for a sandwich bread, and very moist. The crust was a little chewier than I normally like. Might have been because of the egg wash.
My spontaneous addition of the ground flax seed turned out great. I don’t really taste it, but I know it’s providing me with Omega-3 fatty acids that I don’t get in my normal diet (I hate oily fish). Adding the whole flax seeds and oatmeal was a great idea (thank you very much). 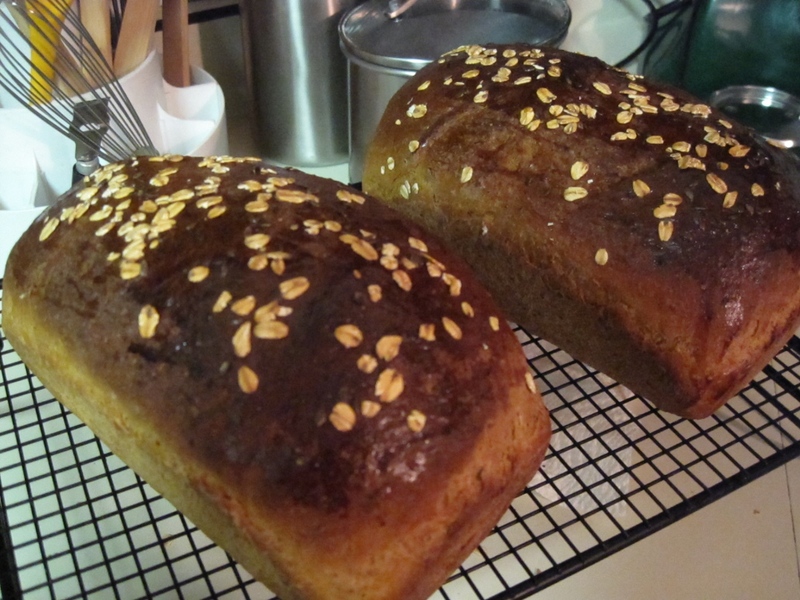 I love breads with texture, and the seeds and oats give the bread heartiness. There’s a nice dark molasses taste, not overwhelming but just enough to give it depth and a slight sweetness. This would make an ideal bread for sandwiches, or even just slathered with butter. Highly recommended. Again, I’d like to mention that you can find a printable version of this recipe by clicking here. If you decide to make it yourself, please let me know what you think of the recipe and any thoughts you have about improving it. Could you make the same recipe in a bread maker? I don’t know. I did think about adapting these recipes for a bread machine, but I’m unsure how. My guess would be to add all of the dry ingredients, then add the wet ones and press start (since it’s the water that activates the yeast). But, I don’t know. Let me research that…it’s a good question. Beautiful…we will have to try this. Thanks Wendy! It’s sooooooo tasty. It’s great for a fried egg sandwich. I made a one-loaf version of your recipe this morning–tweaking it for our 3-cup bread machine. I used the manual cycle and did the final rise and baking in the oven. Note: local flour can be somewhat unpredictable–add too much and the bread is dense. So I give my recipes a range for flour and gradually add it just until the dough holds together. I added all of the above ingredients into the machine and turned it on. Add 1 cup of all-purpose flour, let it mix. Add another 1/2-1 cup of all-purpose flour slowly per note above. When the machine stops, with buttered hands I gently folded the edges under and placed it in a buttered glass pan. Let it rise an additional 25 minutes in a warmed oven then turned the oven up to 350 degrees and let it bake for 40 minutes. I’ll let you know the results shortly. It smells heavenly! Wow! Sounds great. I love the addition of sunflower seeds. Can’t wait to hear how it turned out! The loaf has a wonderful texture and tastes great. Thanks for the inspiration.